Entryway: There are two keys that were given to us for the two doors. 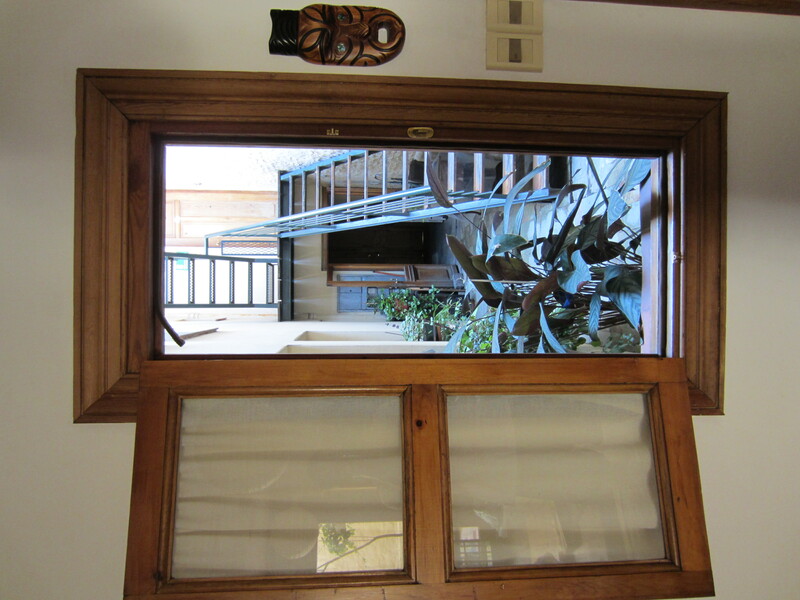 There is a door that opens to the street and another door into the apartment. 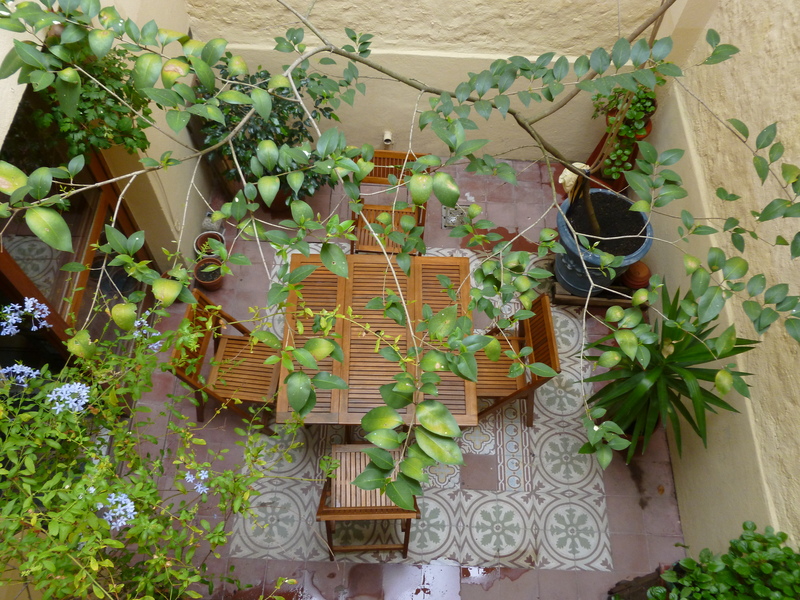 Between the two doors there is an atrium of sorts with a stairway up to the roof and some plants and such. Raul told us to be respectful of the space between the doors and to be quiet. Looking out the window into the entryway. The doorway you see leads to the street and the stairs lead to the rooftop. Living room: The living room has a cool tile floor, a couch, a chair, and a coffee table. There is also a TV with DVD player and cable which we’ll probably never use. There is also a stereo which Asa has promptly set up with our airport so we can play music through it from our computers. 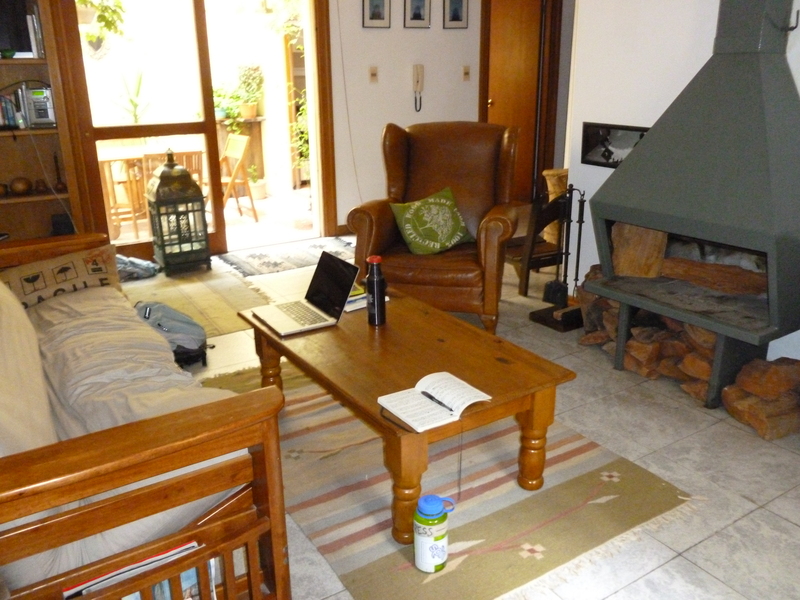 There is also a fire place which we’ll definitely never use, as its way too hot. Raul also directed our attention to an antique drum, a “candombe” drum, which is a traditional Uruguayan drum used during carnival. He told us under no circumstances, especially when we were drunk, were we allowed to play the drum. The living room from the front door. Atrium: The atrium is a great little place open to the sky and contains numerous plants. Raul gave us specific instructions on how to water the plants. This might be my biggest concern about The Little House. Asa and I have been known to kill bamboo (of course we didn’t tell Raul this). We’ll do our best. 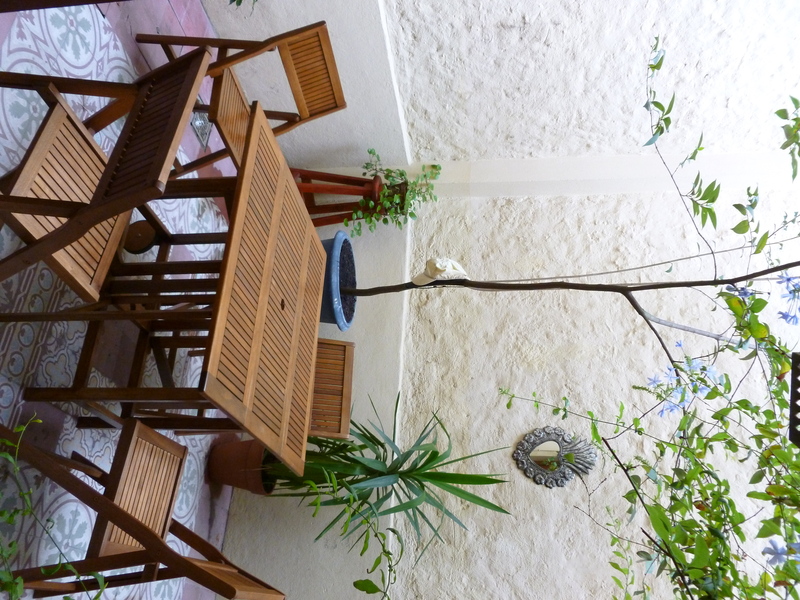 There is a beautiful table and set of chairs to use in the atrium but need to be brought in from the rain. Thus far, every day we’ve been here has had a chance of rain greater than 50%, but we’ve only seen a couple of drops. Guess we’ll figure out when it’s actually going to rain once we’re more familiar with the weather patterns. Table and chairs out in the atrium. View of the atrium from an upstairs bedroom window. 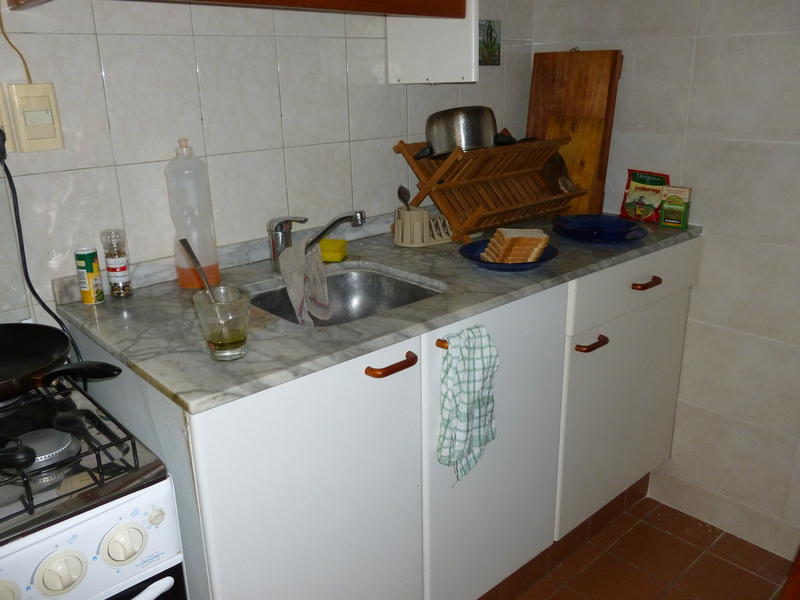 Kitchen: It’s tiny. There is a new, small gas stove with burners, a sink, minimal counter space, a small fridge, a microwave, a toaster, and a hot water pot. The Little House and its water tank are almost 100 years old, so Raul recommended not drinking the tap water and instead buying bottled water. 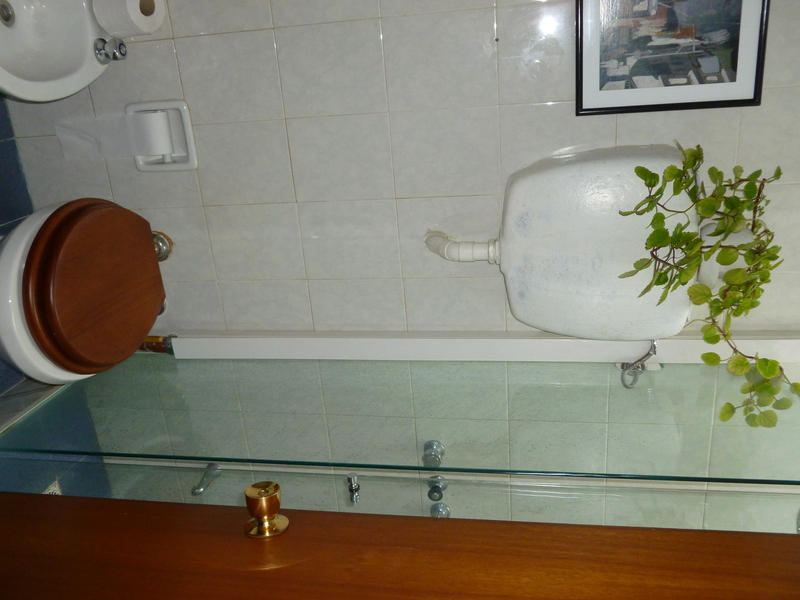 There is a large ceramic jug with a spout on a stool for this purpose. Raul also has a collection of glasses and has requested we use the ones that are not part of any sets, that way its not so bad if we break them. The kitchen featuring the new little gas stove and the door into the atrium. 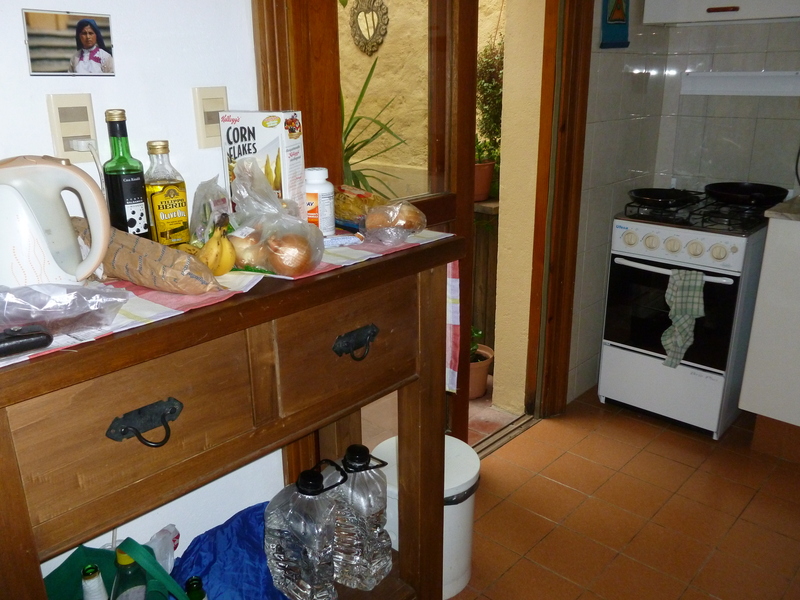 Yes, this is all the counter space we have! 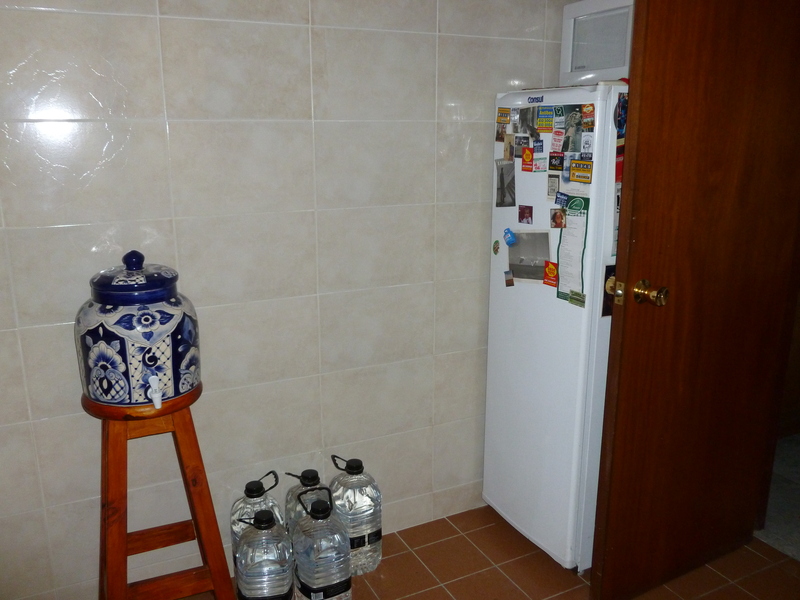 The water jug and our half-size fridge. Bathrooms: There is a full bathroom upstairs and a half bath downstairs. Both toilets have a holding tank and flush on the wall above. It takes forever for the tank to refill after its been flushed. We’ve also been warned not to put too much paper down the toilet. What “too much” is, is a mystery I hope we never solve. This is the upstairs toilet and shower. Yes, that is yet another live plant we'll try to keep alive! Bedrooms: There are three small bedrooms upstairs. A somewhat larger bedroom has a queen bed and a somewhat smaller bedroom has a twin bed. 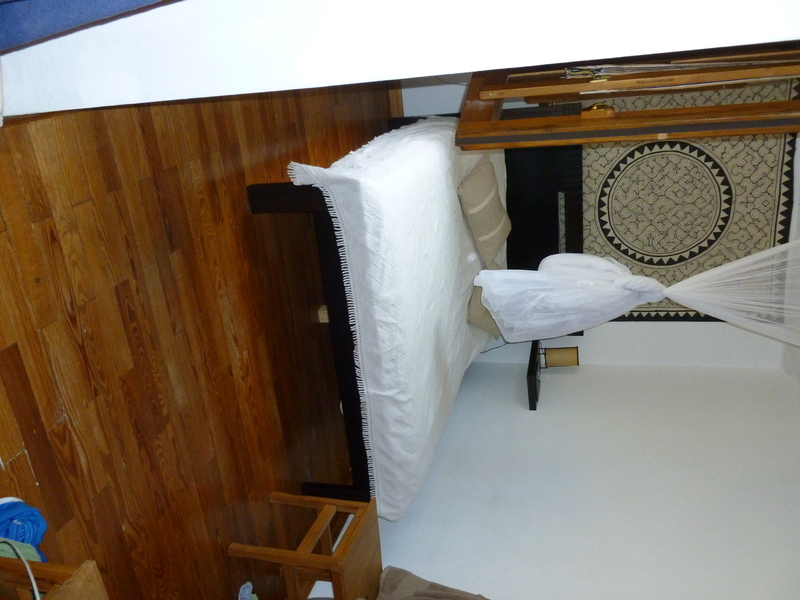 Both beds have a mosquito net hanging from the ceiling, although we’ve only seen a couple of mosquitos. We keep the windows open all day and night so the house can “breathe”, so the mosquito nets can’t hurt. Both of these bedrooms have windows that open to the atrium. 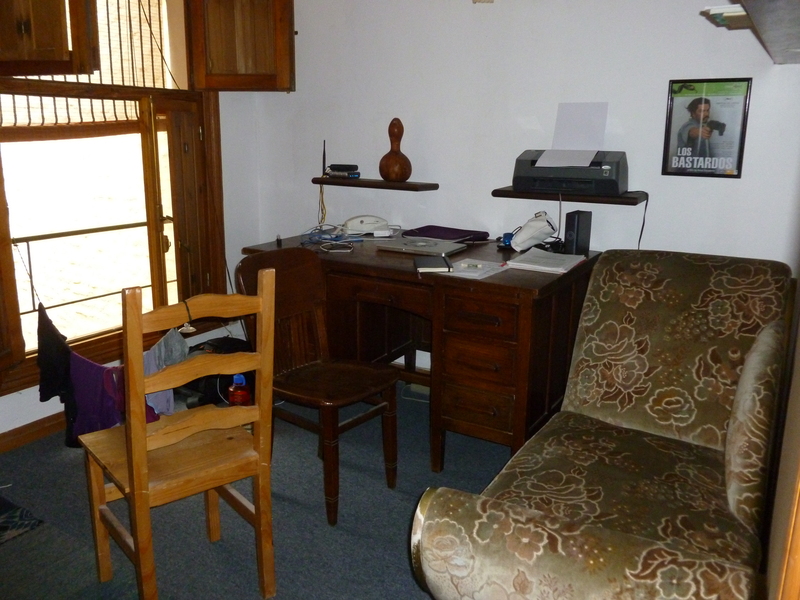 The third bedroom is an office with a desk. Its’ windows open into the entryway and it’s darker than the other two rooms for most of the day. Rooftop: In the entryway there are stairs leading up to the communal rooftop (there are two other apartments in the house). The stairs have a locked gate at the top so that no one can get into the house from above. 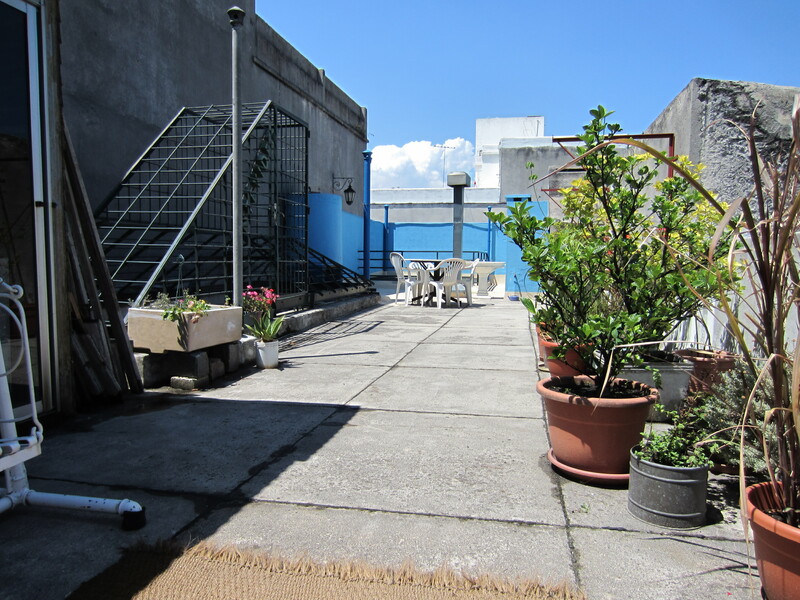 On the roof there is a table and chairs, a place to hang a hammock, and a space to grill. The grill is old-fashioned and necessitates building a fire and placing meat over the flame. There’s not much of a view from the roof, as all the buildings are about the same height and the streets are lined with trees. The rooftop. The gate on the left leads down the stairs into the entryway. All in all… It’s a pretty awesome little house. This entry was posted in Living Conditions and tagged atrium, bathroom, bedrooms, entryway, house, kitchen, living room, plants, water, windows by mlwattsupp. Bookmark the permalink. Love it! Looks awesome. However, I am slightly worried for those plants. Randi, it sounds wonderful!! I am so excited/jealous! You may not need this advice, since you never asked, but I was, and always will be, your teacher. So….advice. Do not use toilet paper in the toilet at all. I was shocked to read that he said you could. This is the first time I have heard that–especially in Latin America. Usually that is a big no-no. Get a covered bucket/trashcan and deal. Also, get a couple more large buckets with lids for water to store in both bathrooms. You never know when the water will disappear and you still need it–especially for bucket-flushing that toilet. Thanks for the advice! We did check multiple times with the house owner about flushing paper and he assured us that small bits (i.e. not huge wads at once) would be fine. The plumbing seems like it’s in fairly good shape, fingers crossed! I knew you’d be the one to not resist the drum, Matt. What a great place. You guys did great…finding it on the internet!! Adios amigos. Habla espanol? Muy pequito!! Played bingo with your mom last night…were your ears burning?